The Shiv Sena had done it again. 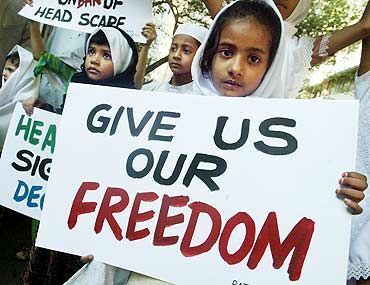 After successfully asking for a ban on Rohinton Mistry's book Such a Long Journey from the Mumbai University's syllabus, the party has now appealed to state Home Minister R R Patil to ban the burqa (veil) after a two-month-old baby was stolen by a burqa-clad woman from V N Desai hospital in suburban Santa Cruz in Mumbai. 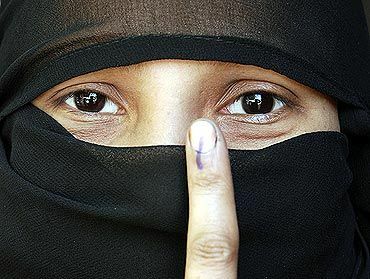 Rediff.com's Ufaque Paikar spoke to women from the Muslim community to learn their views. Though reluctant to appear before the camera, understandably, they were not short of words to slam the Sena's call. Amna Rehman, who is pursing her masters from UK's Bournemouth University, sees no point in the blame game. She says, "Wearing a burqa is one's own choice and is a part of someone's identity. Nobody has the right to intervene or comment on someone else's personal choices. The focus should not be on the fact that a woman in burqa kidnapped an infant, but on why children are being stolen from hospitals?" Some consider these diktats as a means of targeting Muslims. 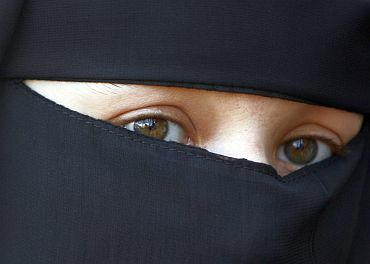 Mojun Bushra, an assistant in an Islamic school, says: "I don't really understand the logic behind seeking a ban on the burqa." "The incident (the kidnapping of the infant) could have been done by any women with or without a burqa. 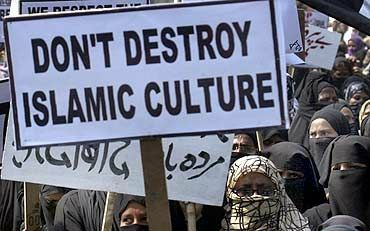 Why is only the Muslim community being targeted for everything? 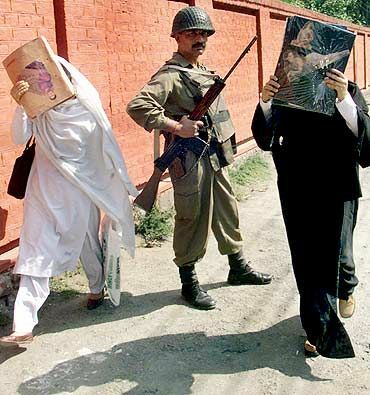 Just because a women wearing a burqa was caught kidnapping, it does not mean that every burqa-clad women is a kidnapper." "The burqa is my identity. I have been wearing it for years and I feel horribly uncomfortable without one." Sena's views may find favour with French President Nicholas Sarkozy who some time back wanted the burqa to be banned as it 'imprisoned' Muslim women, and a practice that should not be tolerated in a liberal society. However a section of Muslim women beg to differ from both views. Farheen Dosa, an architect, says: "The burqa, for me, is liberation. I have been wearing it for the past nine years. Instead of restricting me, it allows me to do my job easily. In fact, the hijab was started as a measure to safeguard women's rights. It gave us the liberty and security to step out of the house without any fear. Islam has given women the right to an inheritance; it allows widow-remarriage. How can you call it backward?" Rafia Khan, who is pursuing her masters from the Jawaharlal Nehru University in New Delhi, believes that dictating terms and conditions for 'liberation' is contradictory to the very principle of liberation. She says: "You should distinguish between practice and malpractice. Hence, the effort should be on targeting the abuse rather than the use." "It is a secular problem whose roots are being dragged into the religious sphere on purpose. In a society like ours, identity and individuality are deeply entrenched in the religious idiom. The ban would be viewed by many as an act of losing one's religious identity, especially when religion pervades the private sphere." "Emancipation, I would argue should not be based on pre-determined notions of emancipation. True emancipation allows the oppressed to recognise oppression in his or her own capacity and to decipher whether an act can be recognised as an oppressive act or not. If any other section decides it, the decision would be no different from an imposition, which will be oppression in itself."